In the Ainay quarters, in the heart of the Lyon presqu'île (between the two rivers), this lovely apartment is located on the second floor of a 19th century building. A short stroll from the centre of town, Une Nuit au Second bed and breakfast allows easy access to the whole city of Lyon. 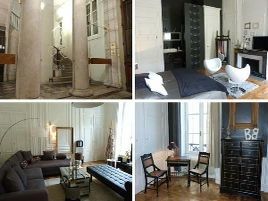 French-style parquet, high ceilings and mouldings are all part of the charm of this typically lyonnais apartment. The decor of the room harmoniously combines old features with contemporary touches and the antique furniture is even for sale. Breakfast is served in a friendly and convivial ambience. A great address!. - possibilité d'acheter les meubles d'antiquaire qui décorent la chambre. - golf de la Tour de Salvagny à 15 km. 1 suite composed of a bedroom and a lounge, shower, WC and TV. The room can be rented without the lounge. Room : 100 euros (1 pers. ), 110 euros (2 pers.). Suite : please consult us. Extra bed 30 euros. The closest station is Perrache, located at 0 km. The closest airport is Saint-Exupéry, to 30 km.